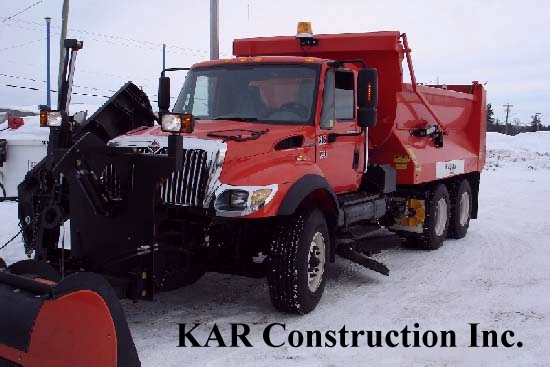 Welcome to KAR Construction Inc.
At KAR CONSTRUCTION INC we provide the highest level of safety, quality, reliability and honesty with the greatest attention to detail. We are committed to getting the job done with the thought of building long-term relationships through unparalleled service. We provide commercial snow and ice removal / management services to Commercial Property Owners, Corporate Office Buildings, Retail Shopping Centers, Industrial Properties, Hospitals/Healthcare, Retirement Communities, Retail Stores, School Districts and Recreational Parks throughout the Milwaukee area. We service numerous commercial accounts, some of which you may visit every day. Why Contract with KAR Construction INC? How well did your contractor perform last season? Did you receive up to the minute email/text notifications before, during and after each event letting you know what was coming and what the plan of attack would be? If needed. Did your contractor have plenty of de-icing materials through the entire season? Did you receive accurate and timely invoices only days after the event occurred? Were your properties clean and safe for your tenants and/or customers after each event? How often did you have to contact your provider? All trucks and loaders 24 hours a day, 7 days a week including Holidays. Our equipment is "state of art". Snow pushers of various sizes on most sites clean areas quicker and more efficiently without the risk of damage and can stack the snow in areas where every parking space is premium. Skid steer loaders give us an advantage in that they are more maneuverable on tight sites thus allowing us to get within inches of obstructions without damage.